It’s the middle of October which means we are finishing the last few items on the winter is coming list. We have all the pieces to put together the chicken and rabbit shelter for winter and will be doing that hopefully within the next week. The pig is going to the butcher Monday with two of the lambs. We will be repurposing the box we brought Miss Purdy home in to bring the pig to the butcher. The project for this weekend is to get the pig box reinforced and back on the trailer to be ready to load her up Sunday evening. Another exciting thing this weekend will be shearing the woolies. Jeff and I have never sheared sheep but luckily a friend of ours is going to come and help us and hopefully teach Jeff how to shear the girls. I will try to get lots of pictures this weekend. Since returning from vacation in florida we have been busy packing and preparing to move in less than 30 days. We have been anxiously awaiting moving day and it is defiantly fast approaching. There are still many decisions left to be made and plans still to firm up. We still need to find and buy a lawn mower as well as an actual tractor for the farm. All of the fencing will need to be installed right after we close on the house for the dogs as well as the livestock. We need to have a barn built before winter comes to house the animals and my tractor. A chicken coop will need to be built for my future chickens that I still have not ordered yet. Needless to say we have been busy both packing and dreaming and planning here. I can’t wait to look out my back door and see this field filled with lambs and Ace! I got to visit my bunnies this weekend at the farm. The babies are getting very big and annabelle loves all the hay she is getting. Sly is super happy all the time as long as he can see the other buns. I think Sly has also made friends with the ducks as well. Pete however is completely unimpressed with the farm, the ducks and living outside. I will probably bring dixie and her growing babies out to the farm and bring my Pete home, as I don’t think he is enjoying his stay at the farm. I also got to see the new lambs at the farm. They are adorable and there moms were extremely angry at us for snatching them to snuggle. I love the sheep and very much enjoy seeing them move. 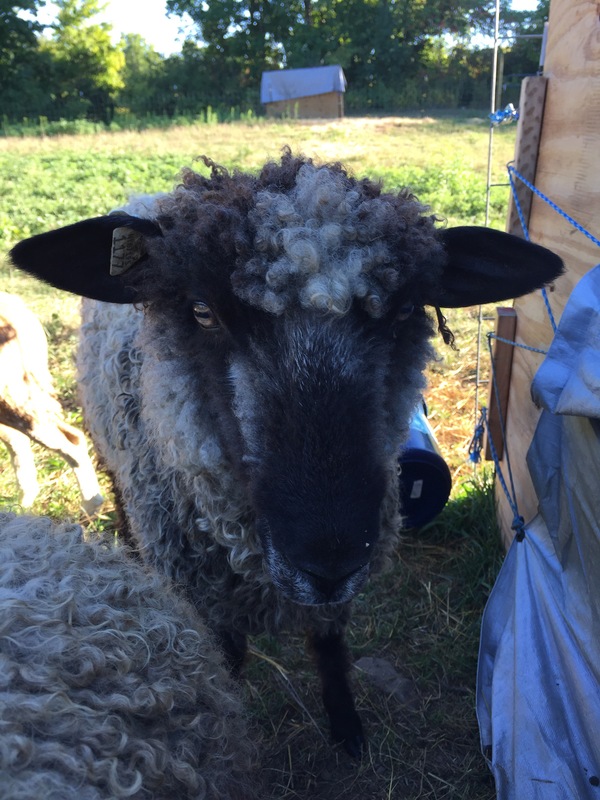 Since we had left all the dogs at home when we left (we went to an open house at a farm on a farm on the way), when we let the rest of the sheep out we didn’t notice that one of the ewes had twine wrapped around its body. We walked all the way out to the farthest corner of the field to bring the sheep back in to remove it. I kept joking with Amanda that I would make an excellent herding dog. I am very excited to get to move to the farm (once we finally find one). It will be wonderful to have Ace at home, my bunnies at home, and some sheep for Gus to herd and me to snuggle. I hope you all had a wonderful weekend as well! At Cacia Farms we like to ensure that all of our rabbits enjoy life as much as possible, even the ones intended for our freezer. We provide them with top quality food, plenty of room to grow and live in, as well as many treats to have. 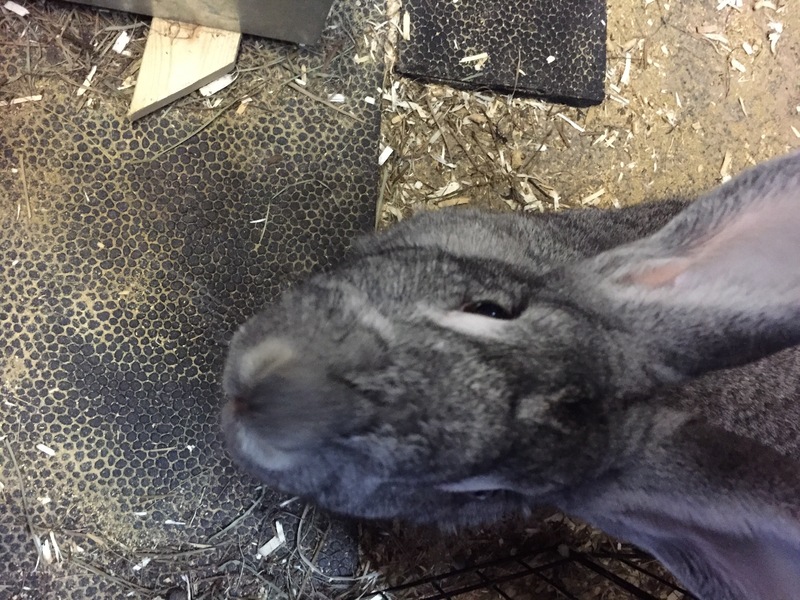 Our adult rabbits that we use for breeding all have unique personalities. Pete loves to run and he also likes to visit his girls. Pete is not a huge fan of hard treats but loves broccoli stems. Sly loves to snuggle and he will do anything for the hard barley biscuits, he is definitely a people snuggling rabbit. Annabelle prefers not to be handled and doesn’t like to venture to far out of her enclosure. Annabelle loves any sort of treat that comes her way as well as pets on the head. Dixie is a super spicy rabbit and makes her opinions known quickly. She does not like to be picked up, will eat anything you put in front of her including yourself. The great thing about dixie is that she is very food motivated. I taught her to go “back in your house” on cue where she will run over an get back in her playpen. 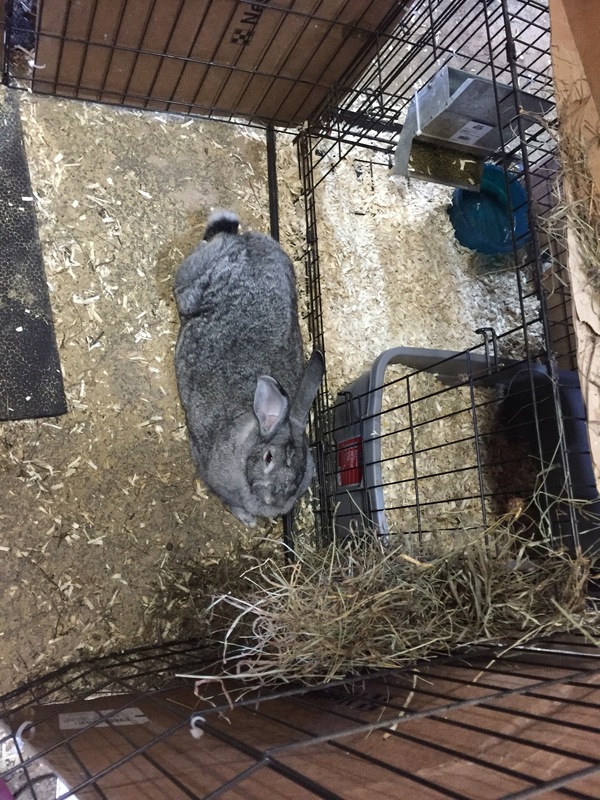 I handle my rabbit as much as possible and let Jeff know the second something is off. We moved everyone but dixie and her babies out to our friends farm while our house is up for sale. I miss sly’s head bumps terribly and pete checking on his lady’s everyday. Dixie and her babies are doing great and I am very glad to have her here. We spent a good portion of the evening moving our rabbit hutches and compost from our backyard into the front yard driveway. Both the compost as well as the hutches are quite heavy. The hutches also boast the quality of being both heavy, large, and awkward. We used a sled to pull them through the 2 foot deep snow. Once they were in the driveway I was so happy to be done with this project I flopped down in the snow! While in the snow I made a wonderful snow angel (my second in my lifetime). Now you may be wondering why we are moving these things during the middle of winter. Well we have finally decided this tiny plot of suburban land is too small to contain our farm any longer. We are in the process of finding a more suitable farm to live on. This also means many hours of painting and updating in our house with a three month old puppy. Our rabbits will be moving to a good friend of ours farm for the duration of our house being up for sale. This makes me both happy and sad. I will be happy to be moving to a larger property but am very upset about not having my rabbits on property to watch. Dixie who just had a litter of 8 will remain here with us until they are big enough to handle the cold. Gus is super excited to hopefully have sheep at home with us and I am very excited to have Ace in my backyard very soon. We have two adult breeding Giant Chinchillas here at Cacia Farms. I love my girls Dixie and Annabelle they are both wonderful rabbits. Annabelle tends to be a bit more sensible than Dixie she is quiet and doesn’t mind being handled or me handling her babies. Dixie on the other hand is much more emotional about life in general. Dixie hates being picked up and handled and does not appreciate me touching or going near her babies. The one great quality both my girls have is that they are excellent mothers. They both build super nests (even if it is two weeks before their due date is two weeks away) and they hardly ever loose any when birthing. Dixie is die on the 17 of this month and I caught her trying to build a nest in her letterbox. 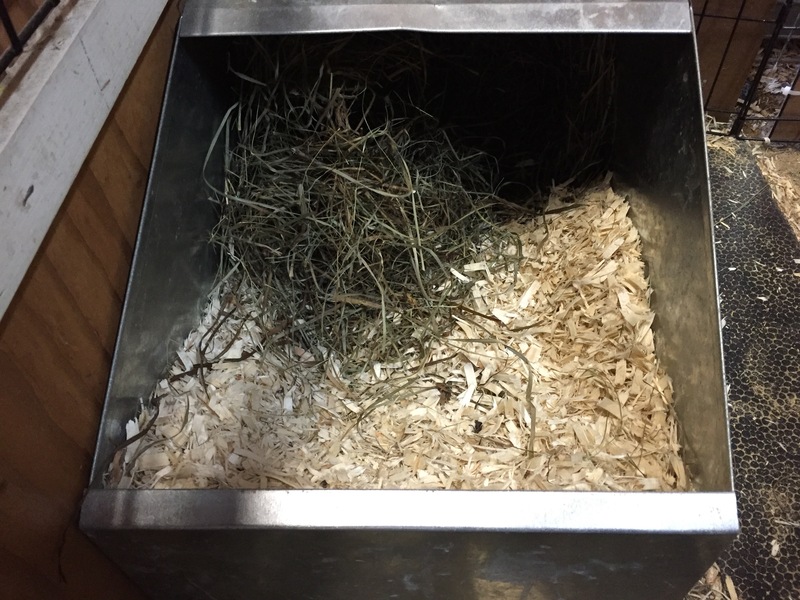 I cleaned her very messy enclosure and gave her a nest box and hay which made for a very happy rabbit. She immediately rearranged the aspen shaving in the nest box. She then proceeded to jump out and start piling in hay. My girls both build early nest but they do wait to pull fur until about 24 to 12 hours prior to kindling. You would think that I would have learned the last time that we had babies in the garage that they are prone to escape. Annabelle had her babies almost 2 weeks age meaning that they are getting brave and wiggly. I came home from herding with Olive and Gus to find all of annabelle’s babies had flew the coop. Luckily our garage is quite secure. I had to get Gus to help me first find then round up our 8 little babies. Annabelle was quite relieved to have her babies back. I however was not looking forward to moving ALL the rabbits again. I ended up putting all the older babies that are growing out in front of sly since Dixie moved into the maternity space. I hope everyone sleeps warm and snuggly, I also hope that they are all where I left them!